Since 1887 when Bishop Vaughan sent Fr. Grainger to start a mission, mass has been celebrated in and around Exmouth at several venues. The first regular mass was at The Lawn (now the Park Hotel) on October 30th. In 1891 the catholic population of Exmouth rejoiced to have a corrugated iron church in Windsor Square, dedicated to St John the Evangelist. In 1912 Lord Clinton offered the site for the Church of the Holy Ghost and the present side aisle was built. Through the subsequent generosity of Mrs Maria Hamilton Thomas the nave and sanctuary were completed. At the time when the population of Exmouth was rapidly expanding thought was given to the provision of a second church near the new estates. Canon O’Malley’s enthusiasm led to the foundation stone of St Anne’s being laid in 1967 and the first mass and blessing by Bishop Cyril Restieaux taking place on March 27th 1968. The land for the church was donated by two sisters, the Misses Payne, who wished for the church to be dedicated to the Sacred Heart. 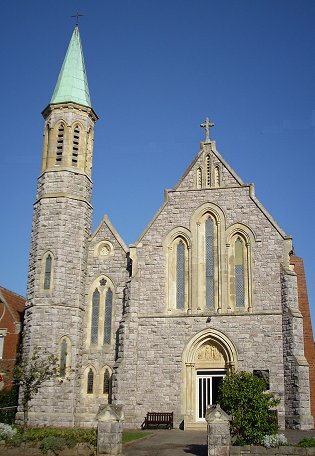 However, since such a dedication already existed in Exeter, St Anne was chosen because local research had shown that in 1413 a petition had been submitted to Rome by the people of Withycombe (West Exmouth) requesting a chapel-of-ease, under the patronage of St Anne, “at the ferry steps” (present Glenorchy Church) and this had never been built since there were, at that time, already three chapels-of-ease in the town. Interestingly, the holy water stoup in St Anne’s came from the 14th century votive chapel of St Margaret of Antioch, rescued through the diligence of Miss Peggy Jago when Chapel Street was demolished to allow the construction of the Magnolia Centre. The architect of St Anne’s, G.K.S.Symons, placed great emphasis on the quality of workmanship and construction to attain simplicity of style. Building was entrusted to Staverton Contractors Ltd., at a cost of £24,000. The contributions of local artists enriched Symons’ concept, notably Philip Lindsey-Clark FRBS (crucifix), Michael Clark FRBS (statue of St Anne), Annette Short ARCA (statue of Our Lady and the Child Jesus) and Wesley B Potter NDD (fused glass and block glass panels). St Anne’s church closed in February 2006. Holy Ghost church was re-ordered in 2007 and a new stone altar and ambo was commissioned for the sanctuary. These are built of Ham Hill limestone and designed and executed by Jay Battle. He also completed the restoration of the reredos and the statues of the Sacred Heart and St Joseph. The statue of Our Lady and the Stations of the Cross were cleaned and restored at the same time by David Britnell through the generosity of parishioners. St Anne’s Cloister was completed in April 2008 and blessed on the feast of the Ascension. It incorporates some stained glass from St Anne’s church and the statue of St Anne. It was built by J Sharland & Sons to a design by Williams Surveyors. The modern Stations of the Cross and the furniture were given by parishioners.